The therapeutic benefits of Hatha yoga arise from whole body energetic balancing combined with distinct biomechanical adjustments. We gave an example of this in our last blog post, where we looked at the disorder known as adult acquired flatfoot deformity, its biomechanical basis and how to utilize yoga to maintain healthy foot arches. In this post we focus on the plantar fascia of the foot and examine the most common cause of heel pain—plantar fasciitis—to see what happens when things go wrong. Finally, we consider how yoga can be used to bring things back into balance and even to prevent this condition. First, let’s look at fascia in general. A fascia is a fibrous structure that is formed from sheets of connective tissue. The deep fascia covers and invests muscles, tendons, ligaments and blood vessels throughout the body. An important example of a deep fascia is the thoracolumbar fascia. All yoga practitioners should be familiar with this structure and its myofascial connections, as it forms a critical support system for the lumbar spine and sacroiliac joint. Other types of fascia include the superficial fascia of the subcutaneous tissue (under the skin), and the visceral and parietal fascia, which surround organs such as the heart and lungs. Figure 1 illustrates the deep fascial elements of skeletal muscles. Click here to see this in the context of stretching and Hanumanasana (front splits). Figure 1: The deep fascia covering and investing skeletal muscle. 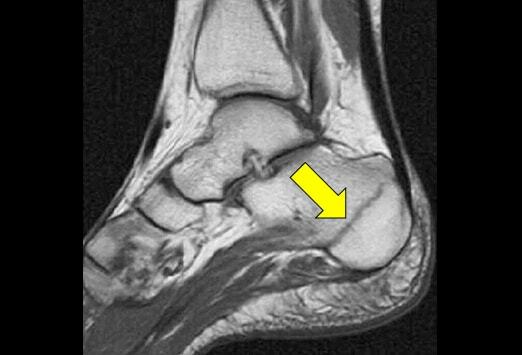 The plantar fascia or plantar aponeurosis (you can use either term) originates from the medial tubercle of the calcaneus (heel bone) and continues forward to attach to the proximal phalanx of each of the toes (via the plantar plates). Extending (dorsiflexing) the toes tightens the plantar fascia, thus elevating the foot arch. During this process, the metatarsal heads act as pulleys to form a “windlass” that tightens the plantar aponeurosis. The plantar fascia has elastic qualities in that its fibers are somewhat wavy in the relaxed position. These fibers straighten in response to forces applied (like the heel-off phase of gait). Thus, the plantar fascia can store energy like a spring. Figure 2 illustrates this concept. Figure 2: The windlass mechanism of the plantar aponeurosis (fascia). The plantar aponeurosis also forms a myofascial connection with the muscles of the calf (gastrocnemius and soleus) via the Achilles’ tendon and, by extension, the hamstrings (and potentially other muscles of the posterior kinetic chain). Forces that stretch the plantar fascia are distributed along these muscles. Conversely, tightness in these muscles can adversely affect the function of the plantar fascia and thus the arch of the foot. Figure 3 illustrates these myofascial connections in Downward Facing Dog pose. Figure 3: The myofascial connections to the plantar fascia in Downward Dog pose. Plantar fasciitis is an overuse injury related to repetitive overstretching of the plantar aponeurosis. In this condition the forces of gait are concentrated where the plantar fascia attaches to the calcaneus, instead of being distributed over the fascia and the muscles at the back of the legs. This results in microtrauma to the plantar aponeurosis near its origin, causing inflammation and heel pain. Risk factors for developing plantar fasciitis include tight calf muscles and hamstrings, endurance-type weight bearing activity (such as running) and a high body mass index. Figure 4 illustrates plantar fasciitis. Click here to see a reference MRI image of this condition. Figure 4: Plantar fasciitis (note the inflammation at the origin of the plantar aponeurosis). Note that there are other conditions that can cause heel pain. 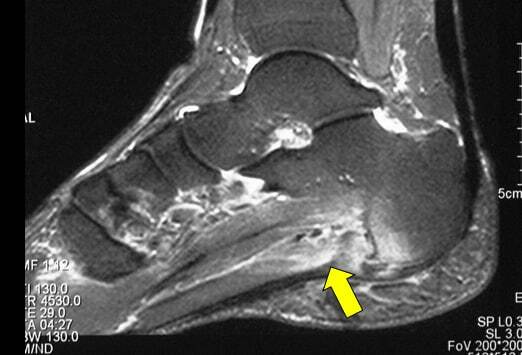 An example of such a condition is a stress fracture of the calcaneus, which is also seen in runners. This problem is treated differently from plantar fasciitis. Accordingly, if you have heel pain be sure to consult a health care practitioner who is appropriately trained and qualified to diagnose and manage such conditions. Use your knowledge of pathological conditions to deepen your understanding of the body and to work with yoga as an adjunct in prevention and treatment. Since one of the most important aspects of managing this condition is stretching of the plantar fascia, heel cords (gastrocnemius/soleus complex) and hamstrings, yoga offers an ancient preventative solution. For example, Downward Dog pose stretches both the hamstrings and heel cords. Click here to see how to use reciprocal inhibition to release the gastrocnemius and soleus muscles and allow the heels to lower to the floor in Downward Dog. Figure 5: Stretching the plantar aponeurosis (fascia) in Chaturanga dandasana. Chaturanga dandasana (figure 5) stretches the plantar fascia itself. Use this image to aid in visualization of this process while in the pose. One of our previous posts gives some tips on how to ease into Chaturanga and another describes a key muscular co-contraction in this pose. Uttanasana illustrates a stretch of the posterior kinetic chain, linking to the feet (figure 6). Click here for a tip on integrating the hip abductors to access sacral nutation to refine Uttanasana. Thus, we can see that the Sun Salutations (Surya Namaskar) offer an ancient self-contained method for working with the plantar fascia and its myofascial connections to maintain a healthy foot arch. For many more tips and cues like this, check out the Yoga Mat Companion book series and The Key Muscles and Key Poses of Yoga. Figure 6: The posterior kinetic chain and its connection to the feet in Uttanasana. Step one: Bend the knee about 15 degrees to release the gastrocnemius muscle at its origin on the posterior femur. Step two: Use the hands to gently draw the ankle into dorsiflexion and stabilize it in this position by engaging the biceps to flex the elbows. The cue I use for this is to "draw the top of the foot towards the front of the shin (dorsiflexion)." Figure 7: Steps to release and then lengthen the calf muscles in Janu sirsasana. Step three: Hold the foot in place and gradually engage the quadriceps to straighten the knee. Ease into this position. Maintaining the ankle in some dorsiflexion with the arms and extending the knee distributes the stretch throughout the calf muscles (the gastrocnemius and soleus) as illustrated here. Figure 8: The myofascial connection between the plantar fascia, heel cord and calf muscles. You can add a facilitated stretch to the calf by gently pressing the ball of the foot into the hands for 8-10 seconds and then taking up the slack by further dorsiflexing the ankle. This activates the Golgi tendon organ at the muscle tendon junction, resulting in relaxation of the contractile elements. We describe a similar technique to lengthen the hamstrings, as well as the physiological basis for facilitated stretching in our blog post on how to lengthen the hamstrings in Janu sirsasana. Thanks for stopping by the Daily Bandha. Stay tuned for our next post when I'll go over a common condition affecting the shoulder joint and its yoga solution. Also, please be sure to share us on Facebook, Twitter and Google Plus. Also, click here to browse through our collection of books on anatomy, biomechanics and yoga. 1) Neufeld SK, Cerrato R. “Plantar fasciitis: evaluation and treatment.” J Am Acad Orthop Surg. 2008 Jun;16(6):338-46. 2) Digiovanni BF, Nawoczenski DA, Malay DP, Graci PA, Williams TT, Wilding GE, Baumhauer JF. “Plantar fascia-specific stretching exercise improves outcomes in patients with chronic plantar fasciitis. A prospective clinical trial with two-year follow-up.” J Bone Joint Surg Am. 2006 Aug;88(8):1775-81. 3) Riddle DL, Pulisic M, Pidcoe P, Johnson RE. “Risk factors for Plantar fasciitis: a matched case-control study.” J Bone Joint Surg Am. 2003 May;85-A(5):872-7. 4) Pohl MB, Hamill J, Davis IS. “Biomechanical and anatomic factors associated with a history of plantar fasciitis in female runners.” Clin J Sport Med. 2009 Sep;19(5):372-6. 5) Harty J, Soffe K, O'Toole G, Stephens MM. “The role of hamstring tightness in plantar fasciitis.” Foot Ankle Int. 2005 Dec;26(12):1089-92. 6) Bolívar YA, Munuera PV, Padillo JP. “Relationship between tightness of the posterior muscles of the lower limb and plantar fasciitis.” Foot Ankle Int. 2013 Jan;34(1):42-8. I LOVE this website! The quality of the graphics, the amazing flexibility of the posts and the way the pictures and graphics pop is so great! As a yoga instructor who works with the 19-23 year olds every semester I sometimes struggle with keeping their attention. This website is scientific and relevant and all can relate to it. Thank you so much and keep up the great work! Awesome! thank you guys for the great information. Excellent information! Thanks for sharing, as a yoga teacher and avid practitioner, I can relate to and use this information to deepen my practice and teaching. Om! Just what I needed this morning.. Seems like the universe still hears me after all :) Great stuff thanks! This is a fantastic article!! I love the detailed information! THANK YOU!!! I am so glad you are back to writing for the site. I wondered what had happened. Your articles/posts are excellent. The information and graphics are outstanding. Thank you so much for the wonderful work you do. Always smile when I see you in my inbox :) and look forward to your articles/posts full of amazing graphics and information. AWESOME PICTURES!!!!! Great article. Thank you for making this!! This page saved me! My father does yoga daily. I have watched him do yoga daily but I never bothered to do it myself for some reason may be I'm lazy. I'm 33 years now and for the past 2 year I have been suffering from left ankle and feet pain (Plantar fasciitis) and because of this pain I was not able to walk hence I stopped going out and even gave up my full time job as I was irregular to work. The pain on my left pain was so bad today so I googled to look for someone who overcame this pain and stumbled upon this site. I tried the few poses for 8 - 10 seconds... and what a surprise my feet pain reduced greatly...WOW.. Though I knew about Surya Namaskar or the Sun prayer I never bothered to attempt it before, but the graphics in this presentation motivated me to give a try and I did try. Though there are lot of content out on the internet on Yoga and poses, your content is awesome.. I know it is a lot of hard work to create something like this and I sincerely appreciate your efforts. I'm loving it! You guys have convinced me to do YOGA, in just 5 minutes..You are awesome. Keep up the good work. I want more content from you. I'm going to read more about you guys and Hatha yoga. Btw do you do any yoga session in Singapore? Thank you very much for this article. It did come handy to share with a client of mine suffering from Plantar Fasciitis and also to apply as part of his treatment (massage/yoga). It started with massaging hamstrings and calves only to find out there was hardly any tension at all in both. I then moved on to the feet where right away it was obvious that the plantar fascia was extremely tight. I massaged the feet nicely and moved on to the yoga stretches. It is important to say that he had a very pronounced medial longitudinal arch, with hardly any range in extending the toes (tight as a rope), which now seems to make all the sense in the world with his condition. Am I correct to say that these factors contributed to his Plantar Fasciitis? I thought it made a lot of sense especially that I basically followed all the poses suggested in your post such as: Chaturanga dandasana, Uttanasana, Janu Sirsasana to stretch the heal cords and extend the toes, moved to Downward Dog at the wall with toes extended and heal pushing into the wall and final pose was downward dog away from wall and by the end, he could touch his heals to the mat, lift his toes and left the session with no pain and a big smile on his face. The poses you have selected have worked effectively in practice with the help of PNF and reciprocal inhibition stretching techniques. I didn't think to check your archives. Thanks for reposting. I will now introduce another complication: bone growth, bone spurs, bunions, and calcium deposits. I heard one alternative practitioner say mine were the result of intensive sitting meditation practice. Regardless they compromise many asanas (i.e. chaturanga dandasana). Would you offer your perspective on cause and, if there is one in yoga, solution? Thank you for this article. Great illustrative pictures. thanks for sharing. It ıs an amazing article. I have PF. Before read your article I didn't believe yoga. I heard about massage but not yoga. I will try. When I spoke with my doctor , he adviced me running shoes and night splint.because I love running but because of pain I couln't run. Now everything is better. Also I had foot pain at nights .with using night splint I can sleep without pain. I will use the knowledge to themselves yoga days and could share this with my friends. Thank you for excellent graphics and knowledge. Love the pictures!! I can't get a stones throw from my toes with my legs straight. Maybe a picture for the other 2/3 of people? Now-a-days, educated and experienced sportsmen have become fully aware of all those situations that might lead to sports related injuries or cause acute pain, so they try preventing all such things with the help of technologically advanced medical facilities. I read a blog - Soulliner and tried following some useful suggestions that helped curing Plantar fasciitis and reliving pain. In summary, Dorsiflexion of the ankle helps alleviate over streching of plantar fascia. Got it. I'm confused a little about the role of the toes, however. In the above Janushirasana example, would it make sense for the toes to be curling rather than extending? SInce toe extension tightens the plantar fascia? If that's right why does the bottom of my foot feel cramped from toe curling and stretched from toe extension (pointing up/towards the knee)? Good source of information. I am interested if I have high arches yoga can help me? Because I buy shoes for high arches and it helped me a lot. But I need more. Something that give my feet more power and I can feel better. This article is very good. I recently started back with yoga after a few months of being inactive except for walking. I am 63. On day 3 I was able to do downward dog and lower my heels. It felt ok at the time but afterward, and for the last week I have pain in my plantar fasciitis and wonder if I over stretched and injured myself? Is this possible? Finally something intelligent and useful on plantar fasciitis. Thank you! I have struggled with PF for many years, which has been exacerbated through running and too much sitting all day. I had noticed that my hip flexors had become very tight along with my calf muscles too and once I started to add some daily stretching, it did help relieve the pain (not completely though). I would like to do more yoga to help improve my overall movement, but also suffer from costochondritis, which flares up badly if I try any sort of upper stretching. Thank you so much for sharing this information. It makes perfect sense. My friends and I (in the 65+ age group) are active tennis players, but there is always someone with PF. This will be very helpful for my teaching. Great article as always! Since you are talking about your feet, I would love to hear your thoughts about foot cramps. I get them often, usually in my toes by also in my arches. I'm a yogi/teacher, and poses with the top of the feet against the floor (e.g., child's pose), can often trigger cramping. I frequently stretch, go barefoot, and even take magnesium supplements, but nothing seems to help. Any ideas?